Multimedia reporter Ben Piven traveled to Denmark in 2005, where he photographed Greenlanders in the capital. That year, when record-high winter temperatures in Greenland exceeded 60 degrees Fahrenheit, Greenlandic political groups continued to lobby for their own state. I read two weeks ago how midsummer’s day was the occasion for big celebrations in Greenland’s capital of Nuuk, a small town snuggled between fjords on the southwestern coast. Clad in sealskin boots and waving red and white Greenlandic flags, a procession of indigenous Inuit people reveled in their newfound autonomy. Greenland had just become an “equal partner” with Denmark, the former colonial power. And the Danish Prime Minister Rasmussen even proclaimed that Greenland could declare full independence whenever it wanted! 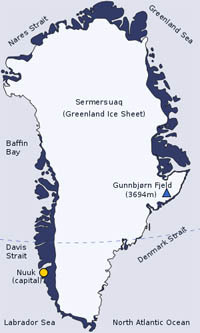 Greenland is a massive expanse towards the north pole that should have been called Iceland or Whiteland, since 81 percent of the world’s 840,000 sq.-mile island is covered with a giant, uninhabitable ice sheet. But Greenlanders will be sticking with the Inuit name, Kalaallit Nunaat, now that the landmass of fewer than 60,000 people is moving farther away from Denmark. Irrespective of the political situation, glaciologists and environmentalists are very worried about Greenland’s main glacier, Sermersuaq. Containing about 10 percent of the world’s fresh water, it is melting at an alarming rate — having receded ten miles over the last decade. But scientists disagree on both the pace and the consequences of the melting, even as Manhattan-sized chunks break off from the island. In the future, thawing glacial streams may provide ample amounts of hydropower. Yet, rising ocean levels and melting permafrost are flooding areas of settlement. At the same time, thawing glaciers have not been detrimental for many farmers. More vegetables could supplement the traditionally fatty Greenlandic diet, which is rich in musk ox, reindeer, and scallops. At the same time, traditional dog-sledding is more difficult for hunters as the ice sheet disappears, and shrimpers lose out when the shrimp stocks move farther north in search of colder waters. The largest sector of the economy is the fishing industry — shrimp, seals and whales. These days, scientists are hoping to extract biogas from the Greenland shark, whose meat is actually toxic to humans. Others are happy about the prospects of global warming facilitating a Greenlandic gold rush. The state-owned oil and mining firms, NUNAOIL and Nunaminerals, are hoping to cash in on potentially enormous underground deposits, which are now more accessible due to rising temperatures. So global warming is a mixed bag, promising greater economic independence as well as environmental hazards. While politically a part of Europe since the 18th century, the increasingly autonomous Greenland is also reasserting its indigenous Greenlandic (Kalaallisut) language and culture. 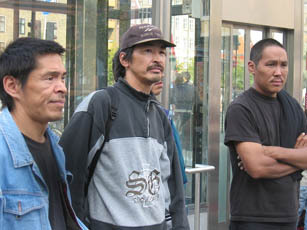 Similar Eskimo/Inuit communities of northern Canada and Alaska are also increasingly seeking more rights. Just last month, Greenlanders elected Kuupik Kleist as prime minister. The head of the leftist Inuit Ataqatigiit (Community of the People) party wants full autonomy from Denmark. In the meantime, the Danish queen, Margrethe II, enjoys largely ceremonial authority over the island. 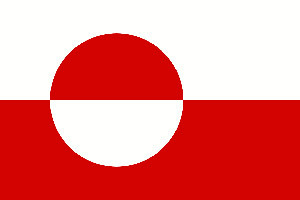 Since 1979, Greenland has enjoyed home rule. In 2008, Denmark transferred more responsibilities to the local government but maintained control over foreign policy, security, and finance. Recently, however, Danish media have lamented the possibility of being dragged into an Arctic arms race, as Canada, the U.S. and Russia also vie for resources. Aside from global warming, the biggest problem for Greenland is how to wean itself off Danish support. Total annual grants are $633 million ($11,300 per Greenlander), which amounts to about half of Greenland’s GDP per capita. Greenland’s young government is hoping that nascent industries such as mining, energy and tourism will make up for the difference. Socially, Greenland is plagued by high rates of domestic abuse, alcoholism, and suicide — especially for the 88 percent of the population who are Inuits or mixed Danish-Inuit. A small number of Greenlanders live in Denmark proper, and many of them are also plagued by alcoholism and dependence on the generous Danish welfare state. In sum, ice-fishing and dog-sled races could start attracting more visitors in a tourist season conveniently extended by global warming. Bright red Air Greenland jets could be flying soon to an airport near you. Reading about the Rare Earth Minerals in great existence in Greenland. Sounds like big business down the line… With the Green Environment hysteria , maybe quicker than we think..